Men's Suits Slim Fit 3-Piece Suit Blazer Notch Lapel One Button Tuxedo Business Wedding Party Blazer Tux Vest&Trousers. 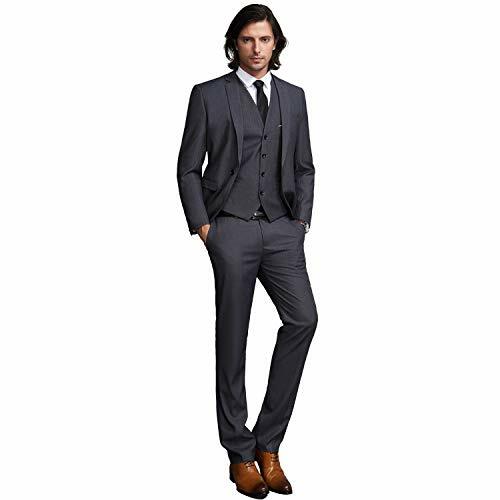 1.Classic Modern: Great three piece slim fit casual dress tuxedo suits for men, The price included suit jacket,button down vest and front flat pants. 2.Design：The Simple and elegant design concept, and the type design；It is handsome and charming when you put on it. 3.Occasion: Wedding, daily life, business meeting, any grandly holiday and ect. 4.Multiple Colors: We have 13 color choices, the 2-3 suits you must need in your wardrobe. White, black and gray shirts can go with suits. It's good for business. Other bright colored shirts for party,prom or other activities. 5.Jackets: One Button Closure,Single Breasted,Notch Lapel;Vests:Four Button V-Neck Vest with Adjustable Back Tie;Pants:Flat Front Pants ,Zippered Fly With Buttoned Waist Tab,Please check the size information before order.